Begin the Beguine (Spanish: Volver a Empezar) is a 1982 Spanish film written and directed by José Luis Garci, starring Antonio Ferrandis. The plot follows the story of a Spaniard who returns to his homeland after many years in exile when he wins the Nobel Prize in literature. 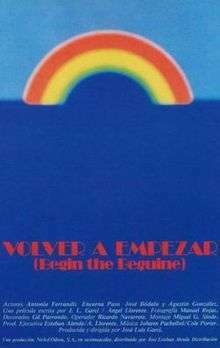 Its original Spanish title is Volver a Empezar, which means Starting Again. The film won the 1983 Academy Award for Best Foreign Language Film, and was the first Spanish film to do so. It is the year 1981, the famous writer Antonio Albajara (Antonio Ferrandis) arrives at Gijón, his hometown, from Stockholm, where he has just received the Nobel Prize in Literature. For forty years, Albajara has been a professor of medieval literature at the University of Berkeley, California. He has alternated his teaching with the literary production that has given him worldwide fame. In Gijón, Antonio is reunited with Elena, his first and great love, before he was forced to his exile in 1937 Civil War. However, this visit is not definitive because a serious and deadly disease affects the writer. ↑ "The 55th Academy Awards (1983) Nominees and Winners". oscars.org. Retrieved 2013-10-13.